The New York State Council of Professional Geologists (NYSCPG) is the principal organization of professional geologists responsible for the advancement of the competent and ethical practice of geology in New York State. 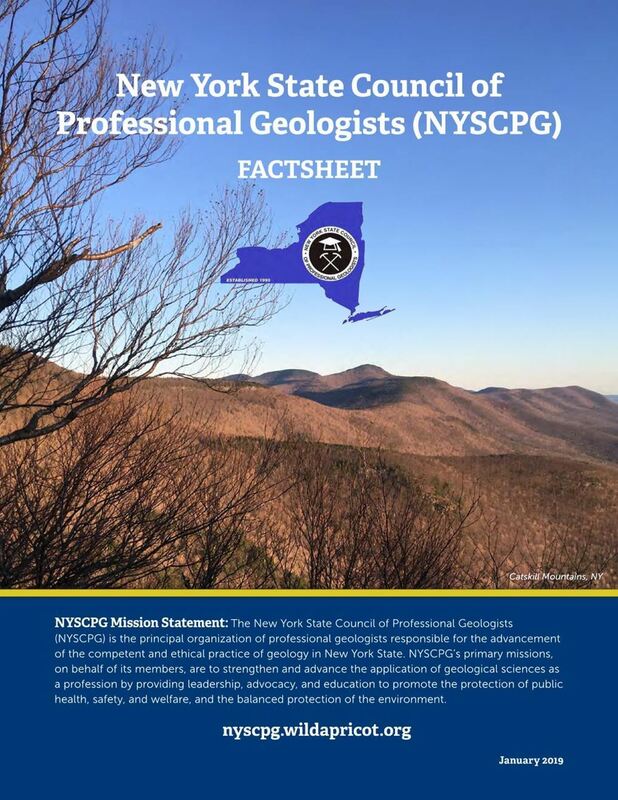 NYSCPG’s primary missions, on behalf of its members, are to strengthen and advance the application of geological sciences as a profession by providing leadership, advocacy, and education to promote the protection of public health, safety, and welfare, and the balanced protection of the environment. For our full mission statement and statement of services, visit About Us. What is a professional geologist? Geologists do much more than study rocks! To learn more, visit Careers. New York State became the 32nd state to require that professional geologists be licensed to practice the profession in the state. Licensure assures the public that decisions regarding geological issues in New York will be made by qualified professionals. New York agencies recognize the need to protect the public and ensure competency by requiring certain activities be performed by licensed professionals, including geologists. Given the geological issues in New York, there has never been a better time or stronger need to mandate the professional licensure of geologists to help protect New York's citizens, natural resources, and the environment. For more information, see Licensure. Please also review our new fact sheet on licensure! The NYSCPG Factsheet was prepared by Ecology and Environment, Inc. A big THANK YOU to ENE for their generosity and support!!! If you are a geologist working or studying in New York State, we invite you to join the NYSCPG. We also welcome and appreciate academic and corporate sponsorship. Keep current, keep connected! 2019-02-15: The USEPA released their Action Plan for Per- and Polyfluoroalkyl Substances (PFAS). 2019-02-05: The New York State Assembly proposes an amend state law and establish the New York State Climate and Community Protection Act. See our News page for a copy of the proposed bill and memorandum.